Transfer by coach from Dijon to Saint-Léger-sur-Dheune. Passengers are welcome to board our ship at 6:00 p.m. After comfortably settling into your cabins, we'll introduce our crew at a welcome cocktail. We'll leave by coach for our excursion towards Nolay, where we will find our trailhead to hike to the Cirque du Bout du Monde, a Natura 2000 natural site. We'll see the imposing chalk cliffs carved out by the Cozanne River which created a blind valley, where a waterfall over 80 feet high adds a touch of wonder. We'll continue by coach towards Mont de Sène, an ancient Celtic religious site which overlooks the Santenay vineyards from a height of over 1,700 feet. In the afternoon, we'll walk to the center of Santenay, a charming little wine-producing village with a priceless historical heritage and wine tasting* session at one of the 38 wine producers' in the village. The end of the afternoon will be spent cruising towards Chagny. This morning will be spent cruising towards Chalon-sur-Saone. Feel free to bike along the banks of the Doubs River by taking the Green Way bike path (1). In the afternoon, join us on a walking tour of Chalon-sur-Saône, birthplace of Joseph Nicéphore Niepce, who, in 1824, was one of the inventors of photography. Enjoy a tasting* of local wines before returning on board. This morning will be spent cruising towards Saint-Jean-de-Losne. Bicycles are available on board if you would like to ride along the canal's banks (1). In the afternoon, join us on a guided tour of Saint-Jean-de-Losne and the Batellerie Museum (closed on Mondays), which will end with a tasting* of local specialties from Burgundy. Afterwards, we'll return on board. The whole day will be spent cruising towards Petit-Ouges. Bicycles are available on board at any time if you'd like to take a bike ride along the canal's banks (1). We'll arrive in Petit-Ouges late in the afternoon. This morning will be spent cruising towards Dijon. 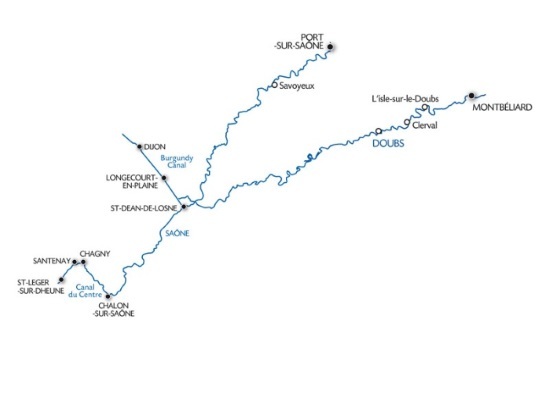 In the afternoon, join us on an excursion along the Burgundy Grands Crus Wine Route. The touristic Grands Crus wine route passes through villages and the finest and most prestigious of the Burgundy vineyards. We'll stop along the way for a wine tasting* session. Tonight is our gala evening and dinner. From Saint-Léger-sur-Dheune to Dijon, join us for a unique journey along the Burgundy canal to discover cities with unconditional charm. Visit Saint-Jean-de-Losne and its Musée de la Batellerie, recounting the history of navigation, and taste regional products and wines in Santenay. Do not miss out on Chalon-sur-Saône, beautiful city of art and history, and hike to the Cirque du Bout du Monde for some gorgeous panoramas: take advantage of this relaxing yet cultural and gourmet cruise that will not fail to surprise you!